5. What’s the TRIGGER that makes HEALTHY People SICK ? ​Why DO healthy people get sick? Clearly the answer to avoiding disease is not found in veganism, paleo, weight loss, avoiding smoking, regular exercise or any of the other helpful suggestions peddled by the media. A good diet, avoiding toxic exposure and taking regular exercise are all valuable in maintaining health. They also dramatically assist in easing the recovery process. But let’s face it, we’ve all heard of the wiry, vegan, health freak who drops dead of a heart attack or succumbs to cancer. And it happens to omnivores too. This single observation, should make something blatantly clear to you. For all our ingenuity, we have not understood the basic ground rules of health and disease. There really is NO health science. All we have is a bewildering array of isolated observations, that may or may not have anything to do with one another. It is pathetic. To reach a conclusion in any complex situation, one must base one’s deductions on certainty at each level of decision making. So ONLY if we KNOW FOR SURE that 2 + 2 = 4, and that 4 – 1 = 3, and that 3 x 3 = 9, can we deduce that (2 + 2 – 1) x 3 = 9 ALWAYS. So you would think that medical ‘science’ is the same. But NO! “Obesity and high blood pressure are often both present in the same individual”. “Cholesterol is above an arbitrary level set to be exceeded by about half the population”. “About half the people who have heart attacks have low cholesterol”. “Some of the people whose bodies have decided to make more cholesterol also eat eggs”. Therefore YOU must take statins, diuretics, exercise and change your diet! Not a single foundational principle has been established! And nobody has even looked for the cause! And the supplements industry is no better. We are told that this vitamin “does” this and that mineral “Does” that. But has anybody asked what the body wants? And why? Until recently, the closest we had to a medical science, was Traditional Chinese Medicine. It has clear, ground rules, with reproducible cause and effect. The effect, being the symptom and the cause being an energy imbalance. But where do the energies come from? In Mr Keshe’s 2014 health teachings, he explains that the soul of the man inhabits the emotional brain. And that it is the magnetic and gravitational field strengths created by the psyche, that yield changes in the structure of the matter of the brain. These brain changes initiate physical changes in the structure of the body. And the material changes in the body result in what we experience as symptoms. Finally, we have the fundamental principles of cause and effect for all health and disease. But is there any proof? In 1979, Dr Ryke, Geerd Hamer presented just that. His PhD thesis, revealed physical proof of a direct correlation between psycho-emotional shocks and physical changes in the brain. These neurological changes that are visible by MRI, trigger immediate structural changes in the organs of the body. 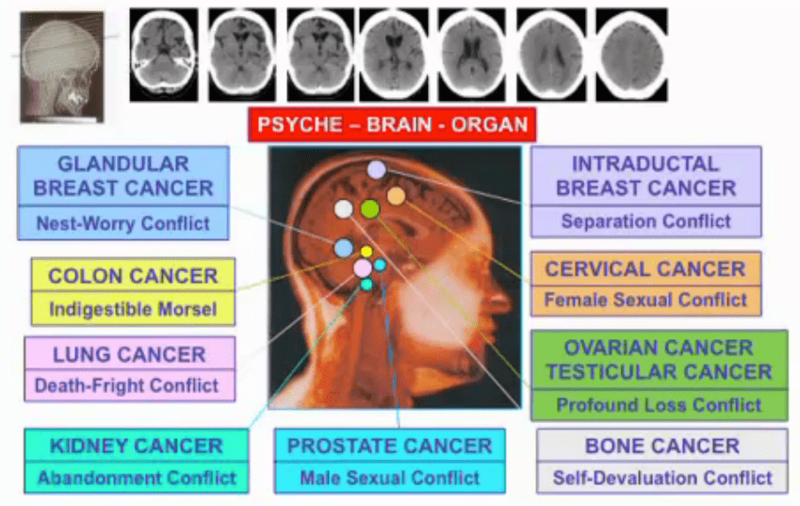 The organ that will be impacted is entirely predictable, based on the type of emotional shock received, and the location of the resulting brain change. For the best explanation I have ever heard on this topic, please listen to the first few minutes of this presentation by Carolina Markolin Ph,D. So now you see the unequivocal downward causation from the emotion or psyche to the brain and physical body. One cannot affect the one without the overs. Therefore, a well chosen FCT remedy, relating to an organ or tissue, will have a neurological and psychological impact, because, bu influencing the field of the organ, one must necessarily balance this change in state with an equal change at the other end of the chain of command – the psyche. Further, if we understand that the psyche creates specific magnetic and gravitational fields via the brain, we can begin to appreciate how the ‘state of mind’ influences the performance of the body. It also becomes clear that if we can master the manipulation of these magnetic and gravitational fields through plasma technology, we will have an unparalleled healing modality. And this is just around the corner.